We will respond to you within one business day, though typically we'll get back to you much more quickly than that. Our office hours are Monday-Friday (9 a.m. - 5 p.m. ET). Click on any tab below to view answers to common questions. I'm having trouble accessing a package/course I purchased. How can I find it? You should have received an email immediately after you purchased the course with access details, so check the email address associated with your myCME account first. If you cannot find or no longer have this email, please log in to your account, click the 'My Account' button near the top right of the homepage, and then click 'Purchase History' in the dropdown menu. This will direct you to a page that lists every course/package you have purchased; simply click the title of the course you'd like to start to begin. Do the CME/CE credits in my package expire? Yes. Each course is accredited for a limited period of time, meaning you can only earn CME/CE credits until the stated Expiration Date (located at the top right of each course's overview page, the first page of the course). Please be sure to complete the post-test at the end of each activity by the stated expiration date in order to earn credits. After that date, our system will no longer be able to process the credits. How can I print a receipt of my purchase? Go to 'My Account', then click 'Purchase History' in the dropdown menu. From there, you can click the blue 'View Receipt' button to the right of each course title to open a PDF of your receipt. I'm having trouble placing an order. What should I do? Please note that certain work networks place restrictions on purchases, so we first recommend trying to purchase the product using a different browser and/or internet connection. Ensure that you are signed in to your myCME account, as this is required for the order to go through. If you require further assistance, please e-mail us at myCME.support@haymarketmedical.com. Does myCME offer any discounts? Yes, we currently offer discounts for students and military personnel (active or retired). To claim your discount code, please email myCME.support@haymarketmedical.com. We also occasionally offer limited-time discounts on certain packages, so be sure to check the package pages as well as subscribe to our newsletters for current discount codes. I'm interested in purchasing a course in bulk for a number of clinicians. Is that possible? Please contact our Online Marketing Director, Tara Hill, for more information at tara.hill@mycme.com. All Nurse Practitioner Associates for Continuing Education (NPACE) pharmacology courses are online-only webcasts. An internet connection is required to watch the videos. Most courses also include downloadable slides in a PDF format. Will the ANCC accept these courses? Yes. The courses/packages are certified by NPACE, which is accredited as a provider of continuing nursing education by the American Nurses Credentialing Center's Commission on Accreditation directly. How many credits/pharmacology credits is each course worth? Each course within our pharmacology packages is accredited separately for a specific number of credits and pharmacology credits. You can find this information on the first page of each activity under the "Maximum Credits" heading near the top of the page and in the accreditation/designation information, located about halfway down the page. For example, if a course lists "3.00 / CE for Nurses; includes 3.00 pharmacology credits," you are eligible to claim 3.00 credits towards any general nursing CE requirement you may have PLUS 3.00 credits of pharmacology. How can I access previously purchased courses or packages? Please log in to your account, click the 'My Account' button near the top right of the homepage, and then click 'Purchase History' in the dropdown menu. This will direct you to a page that lists every course/package you have purchased; simply click the title of the course/package you'd like to start to begin. If you are accessing a package, you'll be directed to a page that lists every course in your package; simply click any title to begin. How many credits is the subscription worth? You can earn up to 1.00 Contact Hour and 1.00 Pharmacology Credit with each monthly issue for a total of 13.00 Contact Hours and 13.00 Pharmacology Credits. What is the format of these courses? Each "issue" is text-based and will be added right to your myCME.com account each month; you will not receive any physical materials in the mail. Can I access the course on my iPhone, iPad, or other mobile device? Yes, you can view them on any mobile device 24/7. How long will I have access to each issue? You can stop and go back to the editions as often as you wish. They will be available for review even after you earn the credits. Once I subscribe, how long will it take before I have access? You will have immediate access to the latest issue. 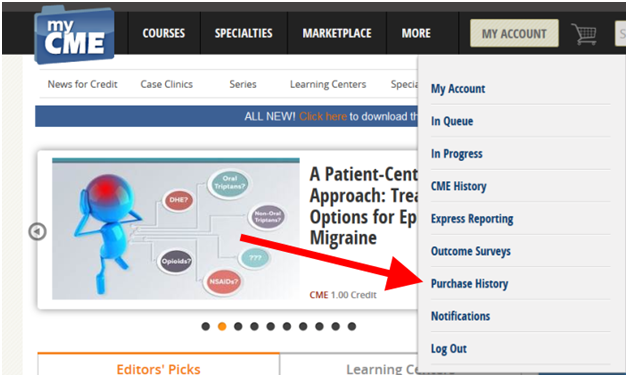 Future issues will be added to your myCME account near the beginning of each month thereafter. You can stop and go back to the issues as often as you wish. I am having technical difficulties with the course. What should I do? Please contact our web support at myCME.Support@haymarketmedical.com. How many credits is the course worth? By completing each of the post-tests at the end of the 15 modules, you can earn a total of 28.00 AAPA Category I CME Credits. Can I access the courses on my iPhone, iPad, or other mobile device? Yes, you can access the course on your device's web browser. Note: You must be signed into the account with which you purchased the course. The course is NOT available on the myCME app. Can I download the lectures so that I can watch them offline later? You can download MP3 audio files that you can add to your MP3 player or burn to a CD. For video files, our system is currently set up so that you can view the lectures only with a live internet connection. It is not possible to download the video lectures to your computer or handheld device to then view offline. Once you purchase the course, you will have access to earn CME credit until July 31, 2019. You can stop and go back to the materials as often as you wish. The materials will be available for review even after you earn the credits or the credits expire. Do you offer practice exam questions also? We sure do. Each of the 15 course modules includes a post-test of multiple choice practice questions that you must pass to earn CME credit (you may retake the tests until you pass). There are 500 total practice questions divided among the 15 modules. In addition, myCME has partnered with Exam Master® to offer access to 2700 more practice questions plus 2 full practice exams. Can I get a copy of the lectures as a handout? All lecture slides are available as PDF files. You can print them out and follow along as you listen and view the slide program. Where can I find the additional clinical tool handouts that are referred to within the lectures? All handouts within each module are available for download as PDFs directly above the video player. Is this course designed more for those taking the PANCE or the PANRE? The NCCPA Blueprint is identical whether you are taking the PANCE or the PANRE. This course is a great review no matter which examination you are taking. The NCCPA now offers examinations for PAs who are interested in Certificates of Added Qualification (CAQs). Does this course prepare PAs to take those examinations? This review course is designed as a preparation tool for the PANCE and PANRE only. It is not designed to review the topics on the specialty CAQ examinations. If I purchase the course from one computer, can I view it on another? Yes! As long as you use the same myCME login, you can access the course on any computer or mobile device. I've been able to access the courses before, and now I can't. How come? The most common reason for this problem is that you have more than one account on myCME and you are not using the login/email you used to purchase the course. Only when logged into this account will you be able to use the course. Please make sure you are using the proper login/email. Can I register for the course and pay by check? We accept MasterCard, VISA, American Express, and Discover. Personal checks are not accepted. Once I register and pay for the course, how long will it take before I have access? Once you have registered and paid, you will be given access immediately. All of the course materials are online. I hear the speakers reference the exams at the end of each day. May I have access to them? The online course is set up so that you must take the exam at the end of each module in order to get your certificate for CME credit. These examination questions are identical to the examinations given at the live course. If I am taking the exam and am interrupted before I complete it, will my answers be saved for me to come back to later? Can I view my post-test answers at a later time? While you will be able to view your scored post-test immediately after completing it, your results will not save in the system for future reference. We recommend printing the pages with your results as soon as you complete the test. Can I retake the exams again at a later date to see whether I have improved? The exams are designed to be taken and saved only one time to receive CME credit. You will need to score 70% or better to pass the exam. If you do not pass, you will be shown which answers were right and which were wrong and given another opportunity, until such time as you score 70% or better. Once you pass, you can take the exams again at a later date and receive a new score, but you will not earn more credit and your score will not be saved. A special discounted rate is available for the following individuals: attendees of the most recent Rutgers live course, preceptors of Rutgers PA students, UMDNJ PA Program lecturers, and graduates of the Rutgers PA Program. Please contact Matt McQuillan (732-235-4445) or matthew.mcquillan@shrp.rutgers.edu) for details. Students in accredited PA programs and those on active military duty qualify for a 20% discount. Please e-mail myCME.Support@haymarketmedical.com for details. I am not a PA but have found that these types of courses are very educational and valuable to my practice. May I take the course anyway? You may certainly register for the course, but you won't receive CME credit since the courses are accredited for only PAs. We welcome your interest and thank you in advance for your participation. Please contact our Web support at myCME.Support@haymarketmedical.com. We strive to respond to all emails within 24 hours, often much more quickly than that. Please allow additional time for a reply over the weekend. What is included with the 90 days to Exam Master? You'll get access to more than 2,700 practice questions from Exam Master®—plus 2 full-length practice tests. How long will I have access to Exam Master's® questions? You will have access for 90 days. Your 90 days do not begin when you purchase the Review Course with Exam Master® option. The access period begins when you open the Exam Master Question Bank and click on the blue "Start Activity" button. You may wait to begin your 90 days as long as you would like. Can I purchase the Exam Master® questions down the road when I want to start? Yes, 90 days access to Exam Master® may be purchased separately at a later time. You may purchase it here. Will I access the Exam Master® questions on the myCME website? Yes. We have worked with Exam Master® to create a seamless experience in which you are able to access all Exam Master® questions and practice exams simply by logging in to myCME and accessing your purchase. Can I get the Exam Master® questions on the myCME app? The Exam Master® questions for myCME customers are not available on the myCME app at this time. However, they are available on mobile browsers (e.g., Safari on Apple devices). What if I want to access Exam Master® questions after my 90 days run out? You will be able to add another 90 days for $249. Please contact myCME.support@haymarketmedical.com for more information. 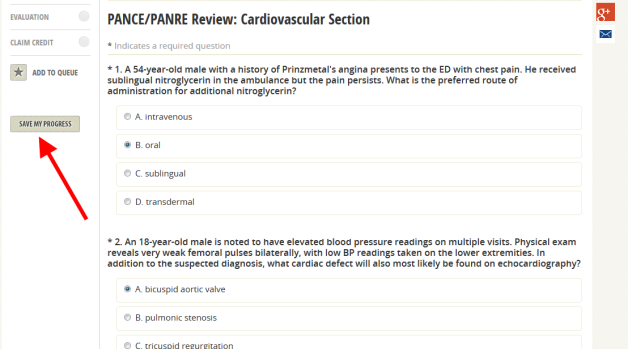 Are the Exam Master® questions designed more for those taking the PANCE or the PANRE? The NCCPA Blueprint is identical whether you are taking the PANCE or the PANRE. The questions are a great review no matter which examination you are taking. If I purchase the Exam Master® questions from one computer, can I view them on another? Yes, as long as you use the same myCME login from computer to computer. What if I already have an account with Exam Master® but my subscription has run out? What if I already have an account with Exam Master® but I still have time left? Can I get a refund based on the myCME special discount when I buy the Review Course? No, sorry. We are not able to refund previously purchased Exam Master® access. I know the self-assessment credit requirement changed. Do I still need these credits? The NCCPA stated recently it "encourage[s] PAs to continue to pursue self-assessment activities." To reinforce its belief in the value of this important education, the NCCPA will now award all PAs 50% additional credit for all activities designated for self-assessment Category 1 CME credit. This means a self-assessment activity worth 20 credits will be converted automatically to 30 credits by the NCCPA, saving you valuable time. What is the format of the self-assessment courses? The courses are completed online and consist of a series of brief case studies (about 1-2 paragraphs long each), each of which is followed by a multiple choice question. You will have 4 tries to answer each question correctly (there are generally 5 answer choices per question). A passing score for each course is 70% and you would need to achieve this passing score to be awarded credits. The full course must be completed (reading the case studies and answering each question, then completing a brief evaluation form) before you can claim credits (assuming you reach a 70% score or above), at which point you will be awarded a downloadable certificate of completion right away. It's designed so that your work will automatically save where you left off so there is no need to complete the course all at once. After you answer each question, you'll be shown a graph of how your peers who took the course answered and shown a detailed explanation of each correct answer. Who accredits these courses? How many self-assessment credits are offered? The self assessment courses are accredited by the American Academy of Physician Assistants (AAPA) directly and the number of AAPA Category 1 Self-Assessment CME credits varies depending on which course you select. You can view all topics here: http://www.mycme.com/self-assessment-for-physician-assistants/section/5351/. The length of the course varies depending on which one you choose to complete, but 1 self assessment credit correlates to 1 hour of learning time. If you complete the Family Medicine Self Assessment Course which is worth 20.00 credits, you can expect this to take approximately 20 hours to complete in full. Can I preview a sample self-assessment course before I buy? A demo of the self-assessment course is available here, and you can expect the same format for all self assessment courses on our website: http://www.mycme.com/self-assessment-demo/activity/2228/.